This is a very thorough exfoliation procedure that is incorporated with a specialized skin program, performed by our therapist. The MDA machine uses a highly controlled flow of fine medical-grade crystals to remove the dead, outermost layer of skin. This skin exfoliation process reveals the new, living skin cells that are soft, smooth and more receptive to nutrients. The underlying dermis is stimulated by the abrasion and vacuum. This promotes the generation of new collagen and improved blood circulation, which thickens the dermis and improves resistance to the effects of aging. Because it significantly reduces the layers of dead skin cells on the face, it is also effective in reducing acne because it unclogs all the pores. It also allows for increased product penetration and so the serums or cosmeceuticals that the client uses can be better absorbed, and so more effective. Patients often comment on how their skin texture looks finer and how the pore size decreases. This procedure is ideal in combination with a skin peel, which should be done 2 weeks after the MDA treatment. 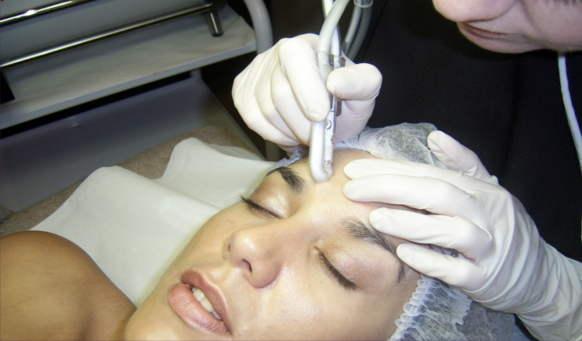 The clients can have a lighter MDA, or a deeper MDA which can cause light peeling afterwards. These treatments are done by our therapists.